Let’s talk about blogging! What is now a full-time job for me started off as a hobby, product of my idleness after finishing a Master’s degree and waiting for job applications replies. I’ve been blogging for almost 5 years, and although it doesn’t feel like all that time has passed, it’s the longest I’ve consistently stuck to one hobby/job in my life. My blog has evolved and grown with me; what started off as a place to offload my beauty addiction with like-minded people, has now become an extension of my brain, where I document my new life as a mum (and all that comes with it! ), as well as continuing to share my beauty tips. 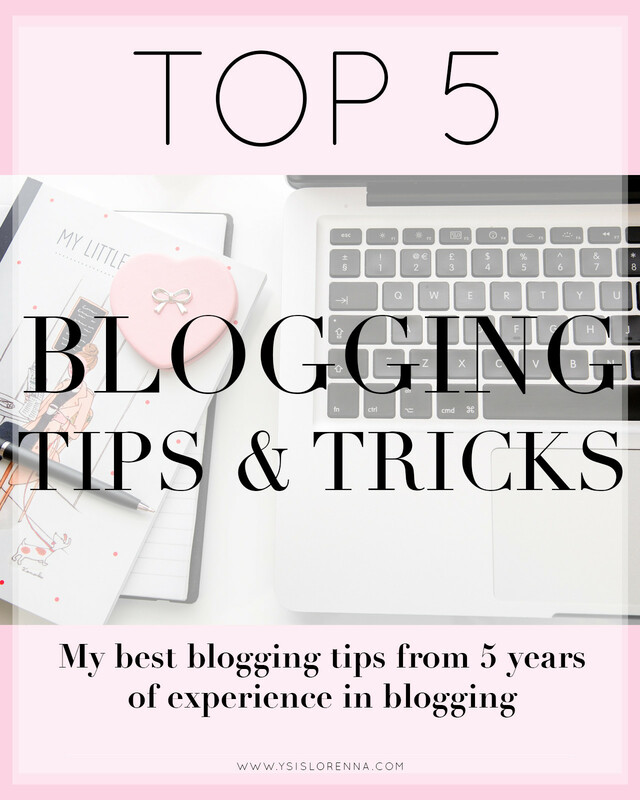 Along these years I’ve picked up some great blogging tips, so I thought I would share my Top 5 Blogging Tips and Tricks, from my own experience, in case you are starting out as blogger, or even if you are a veteran but wants to spice things up on your own blog! I’ve taught myself almost everything I know through research, trial & error and Google – you can do it too, it’s not too difficult. I will list some of the more general blogging tips and tricks below this post, but if you’re looking for something a bit more outside of the box, you might find this post useful. 1. Think like a blogger, all day everyday. When an idea pops in your head, indulge it – anything has the potential of turning into a blog post. Talk to yourself (out loud or not) as if you were writing a blog post and think it through. If the general idea has a nice ring to it, write it down on your phone, or even use the voice dictation tool to turn words into text onto your phone notes. I come up with most of my ideas when I’m doing the washing up, after I’ve put my son to bed. I let my mind wander free, and if I think of anything worth blogging about, I make a note of it (even if it’s just a word) as soon as possible before I forget it. 2. Don’t worry about being concise; worry about your grammar. Now, this is a blogging tip from a reader’s perspective. If there’s one off-putting thing for me when reading a blog, is bad grammar. Spelling mistakes, carelessly written sentences and a general lack of attention to detail with the text, will get me rushing up to that ‘close tab‘ button like nothing else. I don’t care about how many words I’m reading; if the post is engaging, I’m happy to read it all – I actually even prefer long-winded posts, because I find myself getting lost in someone’s thoughts and getting to know someone’s style of writing better; a bit like reading a good book that you can’t put down. Yeah, some people like short and snappy blog posts, but if your readers have stuck with you despite a 2,000+ words review of a foundation (thanks, guys! ), then they like what you’re writing despite your inability of being concise, or maybe even because of it. Don’t feel pressured to limit your words for fear of boring your readers; if you’re happy reading what you wrote, I’m sure other people will too. 3. Make an effort to take clear and high quality photos; it will pay off! I always receive very good feedback from my readers about my photos. I make a big effort to take good pictures, and it is a bit more time-consuming than it probably should be, but in my opinion, it pays off. My blog gets a huge amount of traffic from Google Image Search, so my photos must be quite attractive to viewers (and SEO friendly!). I don’t do anything special or magical, after all, I am not a professional photographer. But I have invested in a good camera and I always make sure to take my photos in a bright environment, that way my pictures are neither dark nor grainy, which are both quite undesirable on good photography (unless that’s the look you’re going for, of course). I also take some time to edit my pictures in Lightroom and Photoshop, and that just gives them a bit of an oomph – maybe to improve the contrast or correct the white balance or even to add a bit more brightness and life to them. 4. Get out there; make your self discoverable. I think this is my main tip to anyone who dedicates a lot of time to create the best content possible, but still isn’t seeing the results they expected in terms of views and subscribers. Are you making sure that people can find your content before anyone else’s? If you write an amazing review about the Giorgio Armani Luminous Silk Foundation with lots of information and comparative pictures, instead of using ‘Best Foundation Ever’ as your title, try something like ‘REVIEW: Giorgio Armani Luminous Silk Foundation (Before & After)’. In basic terms what you’re doing is called SEO (Search Engine Optimisation). That way you are maximising your chances of ranking at the top of searches for lots of keywords linked to that particular foundation. I like to have my main keywords on my post title, permalink, all images for that post and on my blog post description. There’s a great SEO WordPress plugin by Yoast which will make this task a lot easier. Let me know if you want to see a separate post explaining how I optimise my blog posts for SEO. You can use this principle with anything you are writing about – make your content keyword-rich, but just ensure they are all relevant to the topic. No one likes to be misled into clicking on a link, just to find out that the post has nothing to do with the title. It’s easy to get sucked into wanting to do what everyone who’s successful is doing and be like them. There’s nothing wrong with wanting to improve, to look up to people you admire and aspire to be like them. However, you will be a much better blogger once you remember that you are yourself, and there’s only so much that you are capable of doing. Sometimes I am guilty of that, and I have to give myself a little reality-check. For example, I really admire people who can stick to a blogging schedule religiously, post everyday at the same time, schedule a month’s worth of posts and videos in advance, but however much I try, I simply can’t do it. Even when I didn’t have a baby to look after, and all my time was my own, I still couldn’t stick to it. It used to frustrate me to no end that I could not be as consistent with my content as other bloggers. But then I realised I have to accept who I am as a blogger; even though a military schedule will never work for my blog, I still produce content that people want to read. As long as I know that, I put a lot less pressure on myself and I’m much happier with my blog, without the guilt of thinking that I should be doing it better. On the other hand, remember your skills and use them to your advantage – what do you have that other bloggers don’t? Maybe that will perk yourself up when you’re a bit down about not being able to do something as well as you expected. I’m quite proud of myself for being able to communicate and write as well in my second language (English) as in my first language (Portuguese). These are my top 5 blogging tips from personal experience, the ones that you won’t find in all the blogging tips and tricks posts out there because they are very personal to my blogging life and how I have grown as a blogger. I hope you have found them useful and that they help you grow your blog further. If you want me to write more about blogging in general, please leave your suggestions for topics below. If you have any blogging tips of your own, I would love to hear them! Yoast Tips would be greatly appreciated! I’m new to it and so confused!